Once again I was in Lucknow, the City about which poets said that it haunts you more when you are away from it. Walking past the historic Rumi Darwaza, which was built in 1780s by Nawab Asaf-ud-Daula, I was filled with nostalgic memories. Even if you have seen these structures from your childhood, the splendour of the entire area has an impact every time you pass by these marvels of architecture. As you walk from Chowk towards the Bada Imambada [also Bara Imambara], the sight of Husainabad Clock Tower or the Ghantaghar, which is the tallest clock tower in the country, strikes you. With the imposing Rumi Gate in the front, the Bada Imambada and the Bhulbhulaiyan [maze] on the right and the Tile Wali Masjid visible on the other side, anyone would feel impressed by the sheer magnificence of architectural heritage in this City, which has not been properly publicised internationally. The entrance to Imambada (left) and Rumi Gate in the front. Rumi Gate symbolizes Lucknow but it hardly gets the sort of attention which other historical gates like Hyderabad's Char Minar gets. Frankly, it is Rumi Gate that fascinates me more, but is it because Lucknow is the City of my birth and I am biased in favour of it! In the eighties, when one could climb up to the top of the darwaza, I often went there and found Yaqub, an interesting man, always enjoying the breeze and the view of Gomti. Whenever he saw someone, he would get up, share interesting tales about the City and the citizens. He spent nearly 15-18 hrs there. He did nothing else for livelihood. Yaqub was graceful and would happily accept even a rupee or two which visitors happily gave. But then he disappeared later. A view of the Rumi Gate from the other side. It was difficult even then to reach the top as staircase had been crumbling and some arches had collapsed. I didn't have to courage to venture there once again and see the decay. The Rumi Gate [called Turkish gate also as it was modelled on lines of a structure in Constantinople], the entrance of the historic Old City of Lucknow, has stood proud for over two centuries. But unrestricted movement of heavy vehicles and traffic that pass through it round the clock has caused tremendous damage to the structure. Sadly there are only half-hearted efforts to preserve the structures. 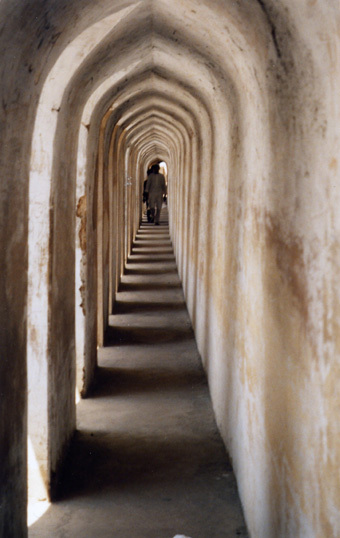 Much has been written about the architectural beauty of Bada Imambada, the Asafi Masjid on its premises and the world renowned Bhulbhulaiyan that has labyrinthine lanes and symmetrical arches and corridors that confuse the visitor. People are bewildered as once inside the building, they fail to find which way leads to the top and how to get to the exit. The three dimensional maze has nearly 490 identical corridors and passages which flummox the visitors, especially when they take a staircase downwards but find that they have landed on the higher plane. The bhul-bhulaiyan also has amazing acoustics. A whisper or the sound of tearing a paper is heard loudly across the other corner. So there was no room for conspiracies. But conspiracies eventually did take place and the British captured Oudh but that's another story. There was a similar underground maze which was shut for visitors long ago. It is believed that it was impossible to come out of it without a guide. And few guides had remained who could successfully take a person in and bring him out without getting lost. The locked entrances to the lower bhool-bhulaiyan are visible though. It is also rumoured that there was a 'surang' [underground tunnel] that connected the Imambada complex to Faizabad. 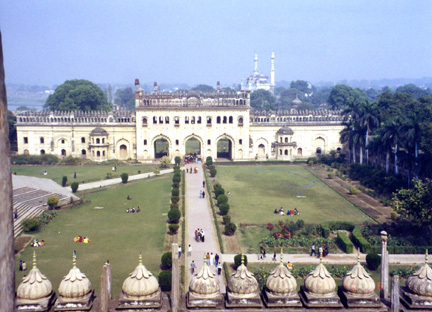 With Chhota Imambada and the incomplete Satkhanda tower nearby, this part of Lucknow is truly unrivalled in terms of heritage as it represents the epitome of Indo-Islamic architecture in Awadh. It is well-known that Asaf-ud-Daula undertook the construction of the Imambada, Rumi Gate and Bhulbhulaiyan to give employment opportunities to people in the times of drought. Those who were reluctant to do the job of construction labourers, could even work at night, and avoid the embarrassment. Everything is bound to change. But the change should be steady, not sudden and abrupt as it leads to chaos. One hears much about erosion of cultural values [tehzib, zabaan] of Awadh, still a lot remains. The structures have also survived the ravages of time and inspite of government apathy. After independence, the Congress-led governments in Uttar Pradesh showed little interest in conservation of the structures that dated back to the Nawabi past. Composite culture was a term used more frequently in speeches now but not put in practice on the ground. The tombs of Urdu poets disappeared or were encroached upon. The great Mir Taqi Mir's grave also fell victim and vanished. After the turbulent 80s that saw the rise of fanaticism in Uttar Pradesh and the after-effects of which were seen in the nineties as well, things cooled down a bit in the last decade. After Mayawati came to the helm, statues of Dalit icons appeared in Lucknow. It was understandable also, as the neglected icons of history belonging to backward classes like the tribal freedom fighters in other parts of the country were given their due. The park named after the great freedom fighter, was changed to Urmil Vatika. Despite protests, BJP had refused to budge and the name was restored only when the State government fell. As the BSP government has now gone beyond its Dalit cultural agenda and went about refurbishing Hazratganj, which has earned government the goodwill of the middle-class, it's time the neglected monuments of Lucknow that need restoration and upkeep should also be taken care of. Will the Lucknow residents raise a strong voice? Lijiye Huzoor: Bun-Kabab haazir hai! The Bun-Kabab is not a traditional street food but over the years it has emerged as a popular non-veg delicacy in India. Though there is no dearth of mouth-watering delicacies but one needs to be aware of the localities where such food is available. Mostly these shops are in Muslim dominated mohallas. It is in these lanes that one gets to find food ranging from 'haleem' [khichda], 'spicy kalejis', qeema samosas, seekh ke kebab to biryanis of all sorts and the ubiquitous chicken. But in recent years an addition has been made in the form of'bun kabab', which has acquired a bigger following and has spread to several cities. Firstly, it's easy to make and serve. If the 'shaami kababs' that are filled inside are good enough and the quality of buns is not bad, the hot bun-kabab tastes heavenly on an empty stomach. In fact, a layer of green chutney and onions inside the bun, can do wonders. It's a close cousin of the burger but when it comes to taste, I assure you the bun-kabab is miles ahead and there is no comparison. Bun Kebab is the winner. Alas, in an era when there is such deterioration of street food that biryani sellers turn the biryani into khichdi and put 2-3 kinds of chutney along with dahi or raaita, the bun kebab stands apart. It is in the labyrinthine lanes in Muslim ghettoes in different cities that you get to find traditional food. Not just non-veg, but also unique sweets like 'nan-khatais' and 'andarse ki goli'. Remember, every kabab wala is not a master and one has to try out at different joints before finding your favourite shop or stall that makes the best bun-kabab or any other similar dish. If you are a real foodie, you will certainly venture out and find out yourself. Quality is a big issue and that's the reason one needs to do lot of survey before finding your favourite joints. Once you have munched enough, it's time for tea. And nothing beats the 'namak wali chai'. It doesn't taste salty. In the huge samovar, the tea maker just sprinkles a bit of salt but the taste and the aroma are altogether different. In the chai-khanas, the elders get the tea in 'pyali' while the youngsters mostly have it in glasses. The 'namak wali chai' seems to energize also. The spectacular growth of newspapers in India in the first decade of 21st century is perhaps the most gladdening and surprising story for media world. Particularly, because the phenomenon was witnessed when America and Europe witnessed drastic fall in readership and several newspapers stopped print editions to switch to just online versions. As I look back I can feel how newspapers and magazine have grown in the country. Ten years ago there were few papers and just a couple of standard magazines. Until 2000, the newspaper industry appeared saturated and no new players were emerging. Perhaps the only exception was Times of India that was growing exponentially. It was no different for the regional language media either. But the situation has changed dramatically in the decade 2001-2010. New mass circulated daily newspapers emerged on the scene and established newspapers also grew. Besides, more magazines are now available than ever. I remember that till 2000, there were few options. Now if I go to a book stand, I return with a fresh issue of a news magazine almost everyday. While India Today and Outlook somewhat retain their circulation, its rival The Week has grown significantly in the last couple of years. 10. MJ Akbar's Covert is launched but when it closes down, he launches The Sunday Guardian weekly. Another magazine The Sunday Indian is launched. Though Arindam Chaudhuri's magazine isn't often discussed much, its editions in 13 languages can't be discounted. The circulation of newspapers continue to grow. While industry pundits predicted doom for print media, they forgot that in India, there is almost 40% population that is yet to achieve basic literacy. Besides, the aspirational lower-middle class and middle class reader often graduates from vernacular to English media for a variety of reasons and this process will continue for at least next 30-40 years. In India revenues aren't drying up as the TV channels have reached their optimum in terms of advertising revenues. However, newspaper remain a major source for information and the classified advertisements continue to grow and fetch returns. The trend was not restricted to English media. Hindi newspapers also witnessed a rise in circulation. While Punjab Kesri declined, the three major papers--Dainik Jagran, Hindustan and Dainik Bhaskar--kept growing fast and are selling in millions. New dailies were successfully launched. Papers like Hari Bhumi and Prabhat Khabar started publishing from new editions while Rajasthan Patrika and Hindustan went for expansion on a massive scale. Patrika went down South and even up to West Bengal. The soaring circulations in Bihar, Jharkhand, Uttar Pradesh and Chhattisgarh forced papers to launch separate pull outs for districts and pages for small cities and towns. While New York Times and Boston Globe had a tough time continuing their print editions, in India regional dailies are selling in millions [tens of lakhs] and the readership is in crores and is rising steadily. Defying global trends and negative predictions, the Indian akhbar survives. This is the reason the decade 2001-2010 would go down as an important period in Indian print industry. Urdu media also grew exponentially. The Sahara group' Roznama Sahara is now published from across the length and breadth of country. Another daily Sahafat expanded from Lucknow and is now published from Dehradun, Delhi, Mumbai et al. The launch of high standard magazines like Bazm, weekly Chauthi Duniya and Urdu version of The Sunday Indian were among other important events. While Siasat, Munsif and Inquilab remain leaders, the daily Etemaad was launched in Hyderabad and it is also a successful paper. 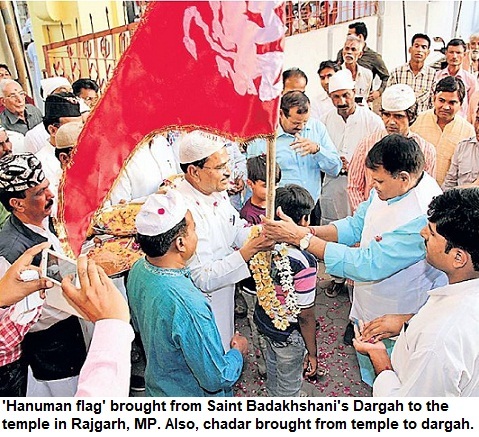 New daily newspapers including Hamara Samaj, Hindustan Express and the recent launch of Jadeed Khabar are forcing the old and existing Urdu papers to compete, look for special stories and work hard to improve themselves. Following ETV, the launch of DD Urdu, Zee Salaam, Alami Sahara and the recent launch of Munsif TV gave a filip to Urdu media in India. In fact, it was a sort of fairy tale story for Urdu media in this decade. The newspapers were in a bad shape and magazines were on the decline till 2000. But the situation has changed so much that even the most optimistic person wouldn't have dreamt about. I am not much familiar with language media in other states but there are new success stories of Telugu newspapers, Malayam, Tamil, Bengali and some other regions. Clearly, it was a decade of media revolution and revival in India. As far as standards of journalism, the trivialization of news, the India TV phenomenon and the focus on Bollywood gossip, I think that's enough material for another writeup. By the advent of mid-90s, almost the entire generation of players that had set the cricket stadia alight in the 70s and 80s had left the scene. Not just all-rounders of the calibre of Richard Hadlee, Imran, Ian Botham and Kapil Dev but batsmen like Viv Richards who had left a deep impact on the game, had walked out of the cricket field. But new players were ready to take the mantle. The brilliance of Brian Lara, Sanchin Tendulkar, Shane Warne and M Muralitharan, who appeared on the scene, was now scene in cricketing arena. It was also the era of a host of colourful-yet-talented players including Shahid Afridi, Andrew Flintoff, Chris Cairns, Michael Bevan and, of course, South African batsman [all-rounder] Jacques Kallis. All of them left a deep impact on the game. The Wills World Cup was again jointly hosted by India and Pakistan. The Greatbatch formula was even more successfully implemented by Sri Lankan opening pair--Romesh Kaluvitharana and Sanath Jayasuriya, whose batting exploits changed the manner in which One Day cricket matches were played. In three matches, the duo hit 115-130 in the first 15 overs itself. Against India, the pair reached 117 while against England they reached 121. Kenya bowlers suffered similar fate. This frustrated the opposition teams as their captains and players were too shocked with this sort of treatment. Against Kenya, Sri Lanka scored 398-5. Pakistan couldn't reach semi-final as they lost to India in quarter-final. Despite a brilliant start by Aamer Sohail and Saeed Anwar, they lost steam and couldn't chase Indian total of 287 and got out of 248. In the first semi final, India batted badly and was 120-8 when spectators got angry and threw bottles in the field. Ultimately the match was awarded to Sri Lanka. A resurgent West Indies made it to semi-final but lost to Australia. In the final, Arjuna Ranatunga led Sri Lanka to their first world cup victory. Arvinda de Silva hit a century and bowled brilliantly to help Lanka win the match. Kalu's careless stroke play along with Jayasuriya's superb batting was the main reason for their victory. Though Kalu faded soon after, Jayasuriya went on to become one of the greats of the game. However, their heroics in the Wills World Cup are still remembered as they changed the complexion of one day international cricket. It was after a long gap that the World Cup returned to England. The matches were held in Scotland, Ireland, Wales and Netherland [Holland]. Once again it was Australia that won the World Cup cup. The team that had explosive batsmen of the calibre of Michael Bewan and Adam Gilchrist, along side Waugh brothers--Steve and Mark, was easily the favourite. The bowling attack was led by Glenn McGrath who was in his prime apart from the spin wizard Shane Warne who could flummox any batsman in the world on his day. They beat Pakistan in a low-scoring and almost one sided match in the final. Earlier, the semi-final between Australia and South Africa had ended in a tie after breathtaking moments. But on the basis of superior run rate, the Aussies reached the final where they beat Pakistan with ease. Indian fans had the consolation that they had beaten their arch-rival Pakistan in super six by 47 runs. The eighth world cup was played in African continent—South Africa, Kenya and Zimbabwe. India, Australia, Kenya and Sri Lanka had made it to the final four. In the semi-final stages, India and Australia won their matches. Ponting led from the front with a superb unbeaten century (140 not out) in the final and despite Sehwag’s 82, India fell short of the huge target (359). Sourav Ganguly’s decision to let Australia bat after winning the toss was criticized. But the reality was that Aussies outplayed India in the match. Glenn McGrath and Brett Lee tore through Indian batting lineup. And Pointing again lifted the cup. The ODI format had already attained peak in terms of audiences' attention and popularity. Australia however emerged as the leading team in late 90s and at the turn of millennium, as players like Shane Warne, Glenn McGrath and Adam Gilchrist gave it an edge over other teams. In the early part of the first decade of 21st century, there was already fatigue visible among players and spectators. Even One Day matches appeared predictable. But in 2007, the ICC Cricket World Cup reached the Caribbean countries who hosted the ninth World Cup. Sixteen teams participated and played in four separate groups in the league matches. India was beaten by Bangladesh in their first match. Though India scored a record 413 against Bermuda in their next match, the team couldn’t get into Super eight. Bangladesh and Sri Lanka qualified from the group. The host, West Indies, couldn’t reach the semis. Australia, Sri Lanka, South Africa and New Zealand played in semi-finals. 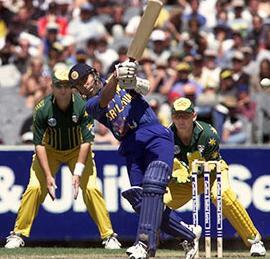 In the first semi-final Sri Lanka beat New Zealand as Muralitharan’s spin bowling flummoxed the New Zealand batsmen. In the other match, Michael Clark’s 160 not out made way for Aussies to enter the final. In the 38-over each final, Gilchrist and Hayden hit 172 runs in just 23 overs. 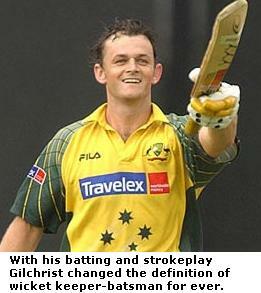 Gilchrist’s 148 set the stage for Australia’s victory. They scored 281. Sangakkara and Jayasuriya tried their best but lost by 53 runs as Australia made history by winning the cup thrice in a row. Now the World Cup Tournament is back in the Indian sub-continent. With batsmen like Tendulkar, Sehwag, Dhoni and Yusuf Pathan, India is fancying its chances. Pakistan also has some extremely talented players including the unpredictable Shahid Afridi who can change the course of any match. *Read the post on History of Cricket World Cups and records from 1975-1992 at this LINK. *Read the post on ICC Cricket, World Cup 2011, timetable of matches, schedule and chances of different countries including India at this LINK.